Create a galaxy far away on your table with this Star Wars Tatooine Dinner Set! 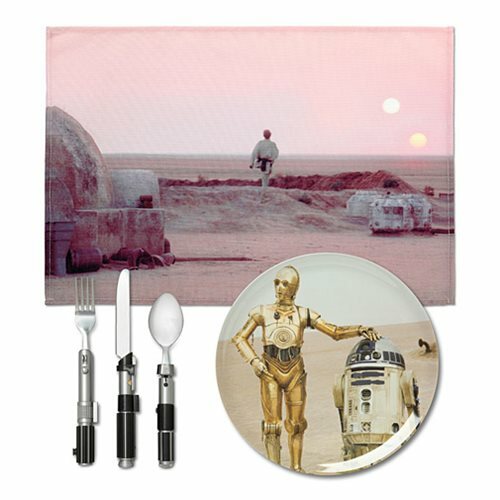 Set the mood with a fabric placemat that features Luke in background and R2-D2 and C-3PO on the included plate. The matching lightsaber utensils complete the scene on your very own dining table! Bring one of the many iconic scenes from the Star Wars films to life in your home with this Star Wars Tatooine Dinner Set! Plate measures about 10-inches in diameter and placemat measures about 18-inches long x 12 1/4-inches tall. Placemat made from 100% polyester, plate is made of melamine, and the utensils are made of stainless steel. Hand wash only. Not dishwasher safe. Do not microwave. Ages 13 and up.